Peter Davison, at 29, is the youngest actor ever to play the part of the eccentric Time Lord from Gallifrey, aged 750, with two hearts, who travels the galaxy in a flying Victorian police telephone box called the Tardis. "The producer, John Nathan-Turner, asked me how I envisaged playing Dr Who and I think it will be very difficult because I am the youngest ever to have played it," Peter said between rehearsing his current BBC series. "But I envisage the character as someone eccentric and youthful. "At the moment I'm doing a BBC series, Sink Or Swim, about two brothers who move to London so I haven't had time to approach the role. I'll start from scratch and concentrate on it fully once this particular series is complete." When the Dr Who television series started in 1963 Peter Davison was a 12-year-old schoolboy hooked on the programme. William Hartnell was then the indestructible Dr Who, followed by Patrick Troughton, Jon Pertwee and Tom Baker. It is screened in 37 countries, spawning Dr Who appreciation societies around the world. "I would like to take the series a step backwards to the way it used to be when I watched it as a 12-year-old," Peter said. "It used to frighten me and I would hide behind the sofa. I would like to make it more exciting with more terrifying monsters. Most of the action has gone out of it. "Douglas Adams, a Dr Who scriptwriter and author of the radio series and book Hitch-hiker's Guide To The Galaxy, told me that the idea behind Dr Who is to make it simple enough for adults and complicated enough for children, who really follow it in great detail. The programme gets letters from children who notice any discrepancies," he said. Peter Davison is completely unaffected by his success as if the days when he was an unemployed actor working as a porter in a hospital mortuary, filing forms in a tax office and working in a dry cleaners are still a bit too close for comfort. But in the past three years his TV series have been great successes. He played the part of Tom Holland in the series Love For Lydia, based on the H. E. Bates book, and the fan mail continuously pours in from his huge following as Tristan Farnon in All Creatures Great And Small. His bouncy nature and laugh are similar to Tristan's but otherwise he is shy and thoughtful. John Nathan-Turner, who was in Australia last year with Tom Baker promoting the series, said his Dr Who will continue as a Time Lord. "Dr Who's all have a common capacity as hero, do-gooder and a person seeing that right is done," Mr Nathan Turner said. "Peter is absolutely ideal. We chose him because he is a marvellous actor, superb at comedy and drama and therefore versatile — and he brings a huge following of women and children from All Creatures Great And Small. We don't start shooting the new series until next month and so we haven't really discussed his role thoroughly yet." Peter was stunned when he was offered the part of Dr Who (at the end of October) and thought about it for two weeks before committing himself. "I wasn't sure at first and then the idea grew on me," he said "I was speechless when I was asked. I hope it won't typecast me. I thought All Creatures Great And Small would but it didn't. "After I accepted the part of Dr Who, I met a past Dr Who, Patrick Troughton, in the BBC carpark. He said it didn't do him any harm because as soon as you stop and someone else takes the part they also take on the new identity." Peter and his wife of one year, actress Sandra Dickinson, 28, are both on a futuristic wavelength at the moment. While Peter stars as Dr Who, Sandra features in a television film of the science-fiction tale Hitch-hiker's Guide To The Galaxy. It is the second marriage for both of them. Neither has any children. When he isn't rehearsing Peter spends his time writing songs and buying books — "which I suppose is one step closer to reading them. Actually I read a lot of science-fiction," Peter said. "I like John Wyndham, Isaac Asimov and Kurt Vonnegut. The last one I read was Sandra's copy of Hitch-hiker's Guide To The Galaxy. He wrote the theme music for two BBC TV series and before they married, Sandra released two of his songs as singles titled Let The Love Get In and Big Star In Hollywood. "They are the type of songs that are only known by people in remote places like Hong Kong or Tokyo," he said jokingly. And how will he be re-incarnated as Dr Who? "They want me to start at the end of the current series they are filming," Peter said. "In the last episode Dr Who will be followed by a strange character in a cloak that's me underneath it, and he takes on a new body." APA 6th ed. : Dawes, Megan (1981-02-11). All creatures great for the new Dr Who. The Australian Women's Weekly p. 142. MLA 7th ed. : Dawes, Megan. 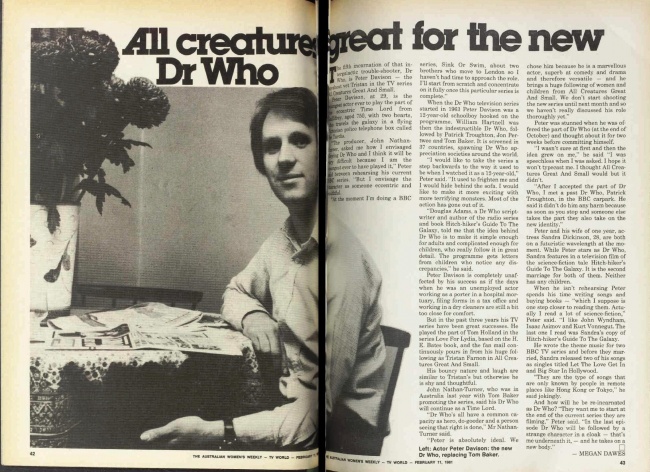 "All creatures great for the new Dr Who." The Australian Women's Weekly [add city] 1981-02-11, 142. Print. Turabian: Dawes, Megan. "All creatures great for the new Dr Who." The Australian Women's Weekly, 1981-02-11, section, 142 edition. This page was last modified on 17 December 2014, at 23:48.